Pascal is a senior JEE Developer and Architect at 4Synergy in The Netherlands. Pascal has been designing and building J2EE applications since 2001. He is particularly interested in Open Source toolstack (Mule, Spring Framework, JBoss) and technologies like Web Services, SOA and Cloud technologies. Specialties: JEE, SOA, Mule ESB, Maven, Cloud Technology, Amazon AWS. Although Hadoop Framework itself is created with Java the MapReduce jobs can be written in many different languages. 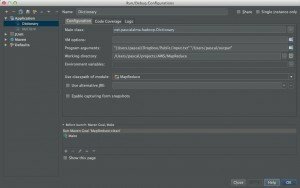 In this post I show how to create a MapReduce job in Java based on a Maven project like any other Java project. Lets start with a fictional business case. In this case we need a CSV file with English words from a dictionary and all translations in other languages added to it, separated by a ‘|’ symbol. I have based this example on this post. So the job will read dictionaries of different languages and match each English word with a translation in another language. The input dictionaries for the job is taken from here. I downloaded a few files in different languages and put them together in one file (Hadoop is better to process one large file than multiple small ones). My example file can be found here. 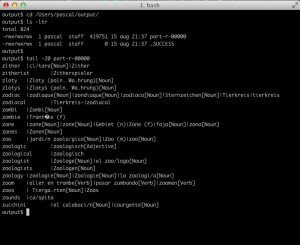 The Hadoop dependency is necessary to make use of the Hadoop classes in my MapReduce job. Since I want to run the job on AWS EMR I make sure I have a matching Hadoop version. Furthermore the scope can be set to ‘provided’ since the Hadoop framework will be available on the Hadoop cluster. The first plugin is used to create an executable jar of our project. This makes the running of the JAR on the Hadoop cluster easier since we don’t have to state the main class. The second plugin is necessary to make the created JAR compatible with the instances of the AWS EMR cluster. This AWS cluster comes with a JDK 1.6. If you omit this one the cluster will fail (I got a message like ‘Unsupported major.minor version 51.0′). I will show later in another post how to setup this AWS EMR cluster. That is the basic project, just like a regular Java project. Lets implement the MapReduce jobs next. This class isn’t very complicated. It just receives a row from the input file and creates a Map of it in which each key will have one value (and multiple keys are allowed at this stage). This Reduce steps collects all values for a given key and put them after each other separated with a ‘|’ symbol. WARNING: Use GenericOptionsParser for parsing the arguments. Applications should implement Tool for the same. WARNING: No job jar file set. User classes may not be found. See JobConf(Class) or JobConf#setJar(String). As you have seen we can run this main method in an IDE (or from the command line) but I would like to see some unit tests performed on the Mapper and Reducer before we go there. I will show this in another post how to do that. 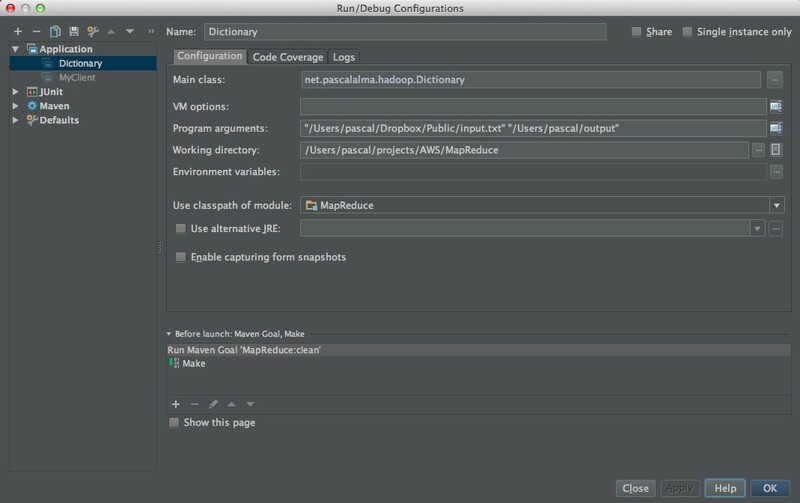 Reference: Writing a Hadoop MapReduce task in Java from our JCG partner Pascal Alma at the The Pragmatic Integrator blog. Tried to run the job as described – in intellij with the config (paths changed, obviously, but otherwise the same). Is there a dependency I’m missing in the pom? I just added the one hadoop dependency per the instructions. 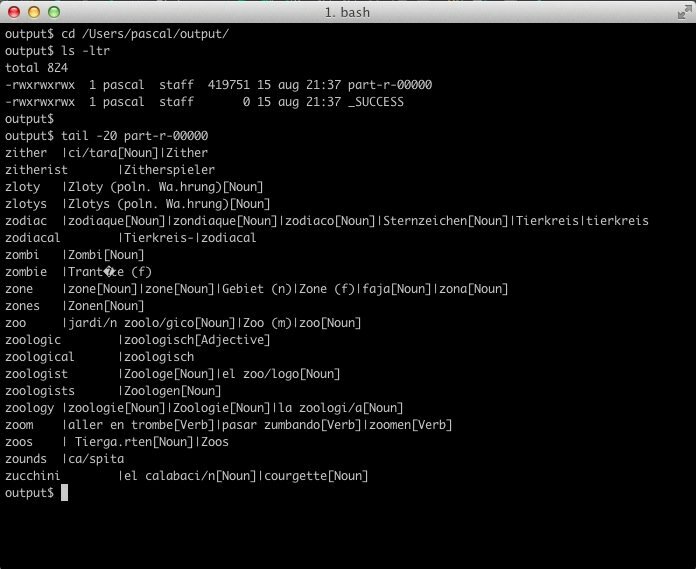 I think you are using a different version of Hadoop or you don’t have the hadoop-common in your POM/classpath. Thanks for sharing info, to perform a MapReduce task, we want a mapper implementation and a reducer implementation. As you could see within the above code, mapper and reducer training are defined as inner training. additionally MapReduce job configuration happens within its major technique, in particular with using an instance of activity elegance. you may go through the WordCount.java code and refer the comments I’ve delivered in there, to apprehend these configurations. Thanks for sharing Appreciate your work. the blog above explains the code which will help you use java programming.